Opening tomorrow. Article written on Thursday in Addie. 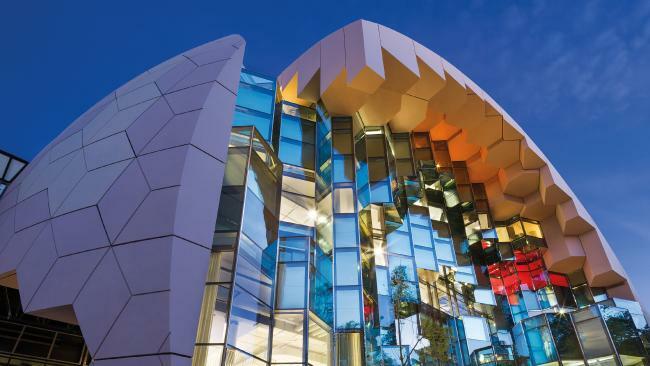 GEELONG’S new $45.5 million library and heritage centre open its doors on Saturday with a program packed full of celebration in the weeks ahead. Doors open Saturday and Sunday at 10am. Join a tour which leaves on the half-hour, beginning at 10.30am. Or explore the building yourself. Meet the architects and hear the story behind the inspiration at 3pm at The High Ground. Roaming performers and book characters. Science shows, story time, authors. Green-screen fun, virtual reality experiences and lots more. WHAT’S GOING IN THE NEXT WEEK? Author Magda Szubanski will discuss her memoir Reckoning, 6.30-7.30pm. Chris Judd with discuss his autobiography Inside, 6.00-7.00pm. Relax and unwind with live music, 5.30-7.30pm. Monday to Friday (ground and mezzanine) 8am-8pm (level one and two) 9am-8pm. The Geelong Regional Library Corporation CEO Patti Manolis said the library would be “a real landmark for the city, which people can be really proud of” with its multifunctional spaces providing space for everybody. “We want everyone to come in and feel a sense of wonder and excitement,” she said. “We want them to see the boldness of the exterior reflected in the services we offer and the spaces inside and we want them to come in and explore the building fully and to find the spaces they really love,” she said.